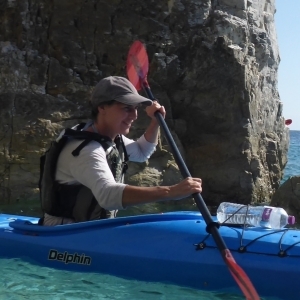 Join Susie and David on a Guided Sea Kayaking holiday along the coastline and river estuaries of South Devon. No previous experience needed, all equipment and coaching provided. 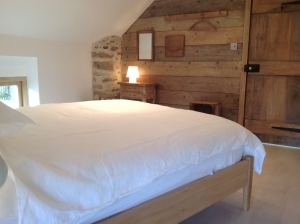 5 Nights accommodation in our Barn House and Farm House. 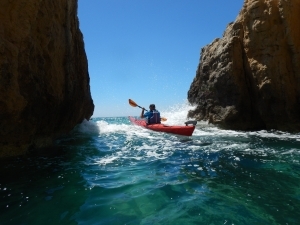 Sea Kayaking allows you to move silently through nature experiencing the wildlife close up and undisturbed while exploring the hidden coves, cut-off beaches, remote inlets and caves you can only discover from the water. We aim to view nature in its natural habitat without disturbing, displacing or damaging it and even more importantly our aim is to leave the beaches, coves and other marine environments we visit in a better condition than when we arrived. 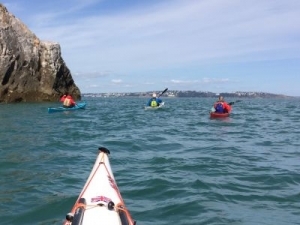 Sea Kayaking is not only a wonderful way to discover the hidden beauty of the coastline and estuaries of South Devon but also a great way to take part in a fun, memorable outdoor activity with a small group of like minded people. 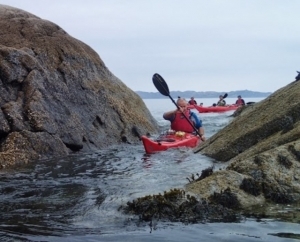 No previous Sea kayaking experience is needed, all equipment and coaching provided. 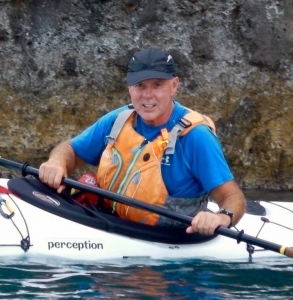 If you have Sea kayaked before this is a great opportunity to improve your skills. 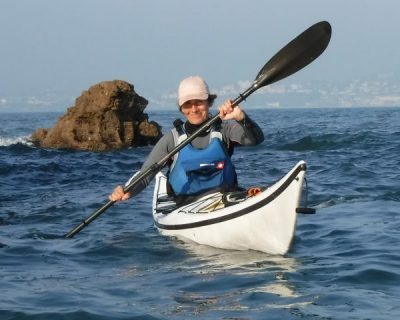 David is a British Canoeing qualified Sea Kayak Leader and Sea Kayak coach and Susie has many years experience Sea kayaking around the South Devon Coastline. 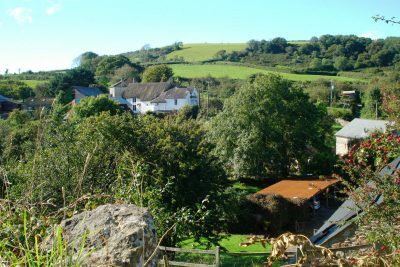 You will stay with David and Susie in their Farm house and Barn house set in a 15th Century Orchard in a valley two miles from the coast and the river Dart. 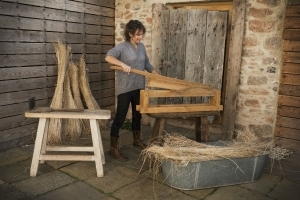 The Farm house has its origins dating back 500 years with a later Georgian addition dating back 200 years. 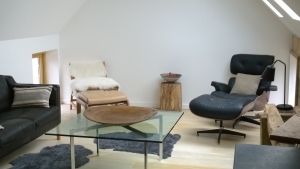 The Barn house is a converted Cider barn renovated with a rustic/contemporary feel furnished with artwork and cushions hand made by Susie. 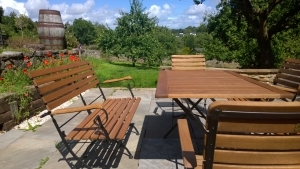 The accommodation is on a bed and breakfast basis, each bedroom has a double bed and guests also have shared use of a fully equipped kitchen to prepare their own evening meals, drinks and snacks. 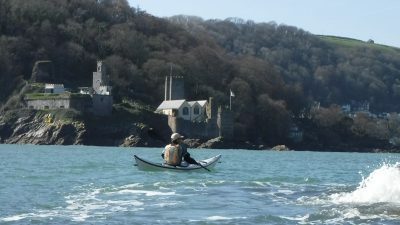 What we’ll do: We will meet up on each of the paddling days at 9:30am. We will discuss the options for the day based on the group, the weather and the tides. We’ll kit you up, load up the Sea kayaks have a safety briefing and head to the water. 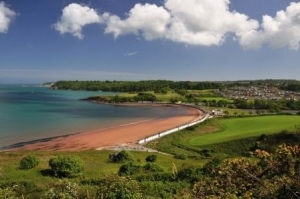 Torbay is an ideal place to start with its sheltered waters, beaches and rocky coves. The coastline is a UNESCO Global Geopark and home to the sea grass beds which are the breeding grounds of our native species of seahorse. 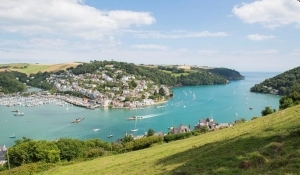 If you are interested in wildlife the Dart Estuary between Totnes and Dartmouth is the place. 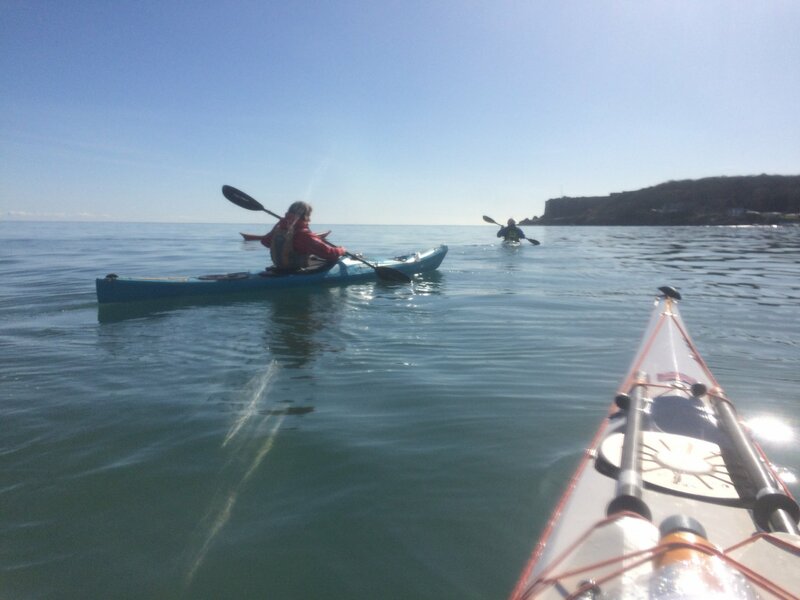 Seals, Cormorants, Little Egrets, Kingfishers, Herons and a wide variety of seabirds are often seen as we paddle or drift along with the tide in amongst the reed beds and remote side creeks. 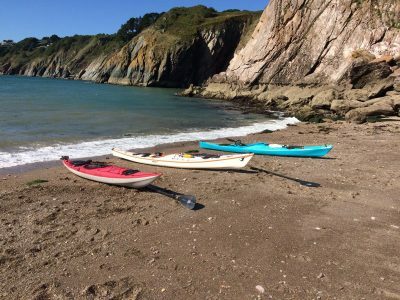 For the more experienced Sea Kayakers, the South Hams coastline, a designated Area of Outstanding Natural Beauty, has a rugged coastline, sea caves, headlands and exposed cliffs for the more adventurous. 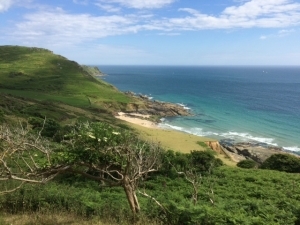 No doubt we will spot seals and if we are lucky we may see Porpoise, sunfish and dolphins and in recent years humpbacked whales have summered along this coastline. To minimise the impact we have on the beaches, covers and estuaries we visit the maximum number of participants will be 6 people. 4 full days of guided tours and coaching with lunch and snacks. 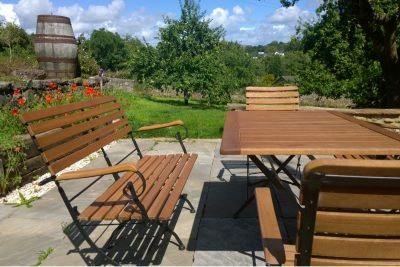 5 nights B and B accommodation in our Barn House or Farm house with a kitchen available for you to prepare your own evening meals and snacks. 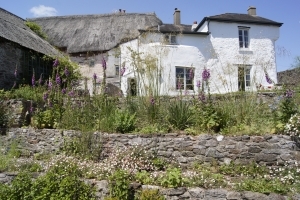 One rest day for you to explore the towns, villages and countryside of South Devon. 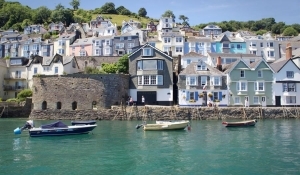 If you would like to walk the Dartmouth to Brixham section of the South West coastal footpath we can drop you off and pick you up. Alternatively if you would like to explore Totnes, the original transition town, once again we can drop you off and pick you up. 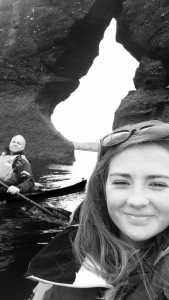 Day 1: Introduction to Sea kayaking coaching session and guided tour. 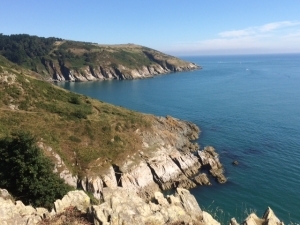 Day 3 Rest day – free day to explore South Devon. 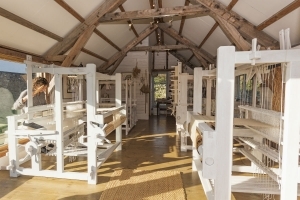 Price: £575 per person and includes 4 full days of guided tours and coaching with lunch and snacks. 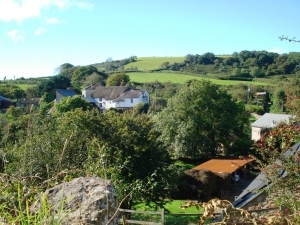 One rest day for you to explore the towns, villages and countryside of South Devon. 5 nights B and B accommodation. Sea kayaks and equipment. 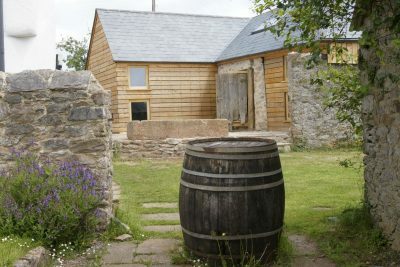 Date: July 2019 Saturday 6th July to Wednesday 10th July with accommodation nights Friday 5th July to Tuesday 9th July. Are you interested in coming along but slightly unsure? If so please let us know by using the contact tab above and you can chat it through with David to see if it is right for you or not. Please use the contact tab above to enquire.